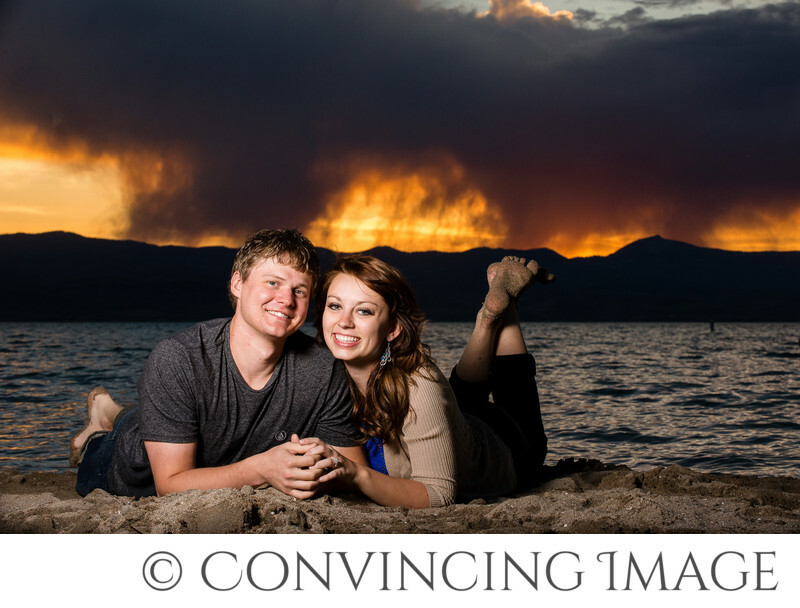 Bear Lake, located about an hour from Logan, Utah is a fantastic place to take engagement photos, for many reasons. Most wedding photographers know that. Not only are there beautiful mountains surrounding the lake, but there is so much variation in scenery within a few miles. Pine trees, aspens, sandy beaches, rocky beaches, docks, wildflowers, and the lake just to name a few. To top it off, there are often amazing sunsets there. This night was obviously no exception. The sky filled with reds, yellows, purples and oranges. It was stunning. The sunset looked like fire with the broken sunlight filtered through the dark rolling clouds. There was no real fire that day, other than the chemistry between the couple. Ally & Chase were more than fun to work with. They were adventurous enough to walk out through the water and not afraid to get their feet dirty (as evidenced by the sandy feet in the photograph). Couples who are willing to have fun in their engagement session always end up picture they will treasure for a lifetime. Ally & Chase were full of laughter and natural smiles, which helped make their pictures even more amazing. After the wedding is over, we are always sad to not get to "hang out" with a couple any more. After spending that much time together taking pictures, we always consider our clients "friends." We often call our photo sessions with a couple a "double date." It feels like hanging out with them all over again when we are editing the pictures too. Being a wedding photographer is one of the best jobs! Location: Bear Lake East, Utah. 1/200; f/18.0; ISO 1250; 102.0 mm.